Another dinner inspired by my culinary hero David Tanis and his book Heart of the Artichoke . In the past I haven’t much gone for prunes in savory dishes (I was traumatized by a pork-prune empanada at an impressionable age), but since David was pushing it I finally decided it was time to give it another try. This lamb shank tagine converted us, completely. We still had all four shanks from the lamb we bought from Martiny Suffolks last summer, and I wanted to be sure we ate them while the weather was still good for braising. My biggest error in the past with lamb shank has been not cooking it long enough, so I started early in the day to make sure it reached the fall-off-the-bone stage. The dish starts (as most tagines do) with onion cooked in butter, then adds garlic, fresh ginger, powdered ginger, coriander seed, cumin seed, saffron, and rather a lot of cayenne. 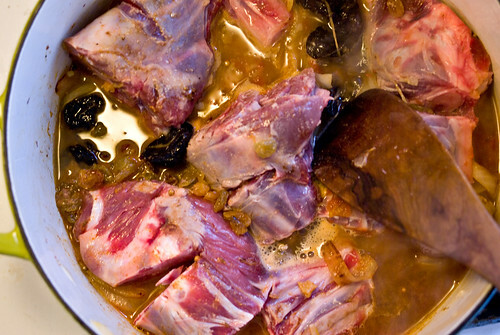 Lamb shanks, prunes and sultanas nestle into the flavorings with a topping of chicken broth and tomato puree, then braise gently in the oven for over two hours. A final handful of prunes go in near the end, before taking the lid off the pot and simmering it at higher heat for a few minutes. The house smelled incredible. The tagine was both savory and sweet, with a cayenne kick that was never quite too much. The lamb collapsed with a mere touch of a knife. The prunes melted into the gravy, giving it an incredible silken mouthfeel. 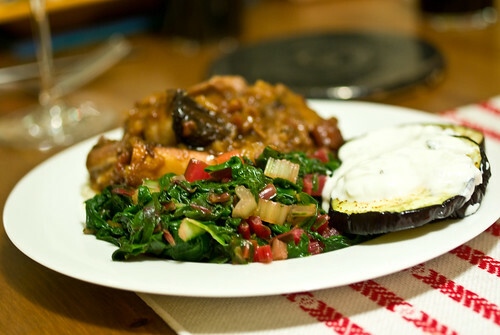 To go with it, I cooked couscous with chicken broth, sauteed chard and spinach, and made a platter of borani: pan-fried eggplant slices topped with yogurt-garlic sauce. We licked our plates. Wow. That sounds incredible! 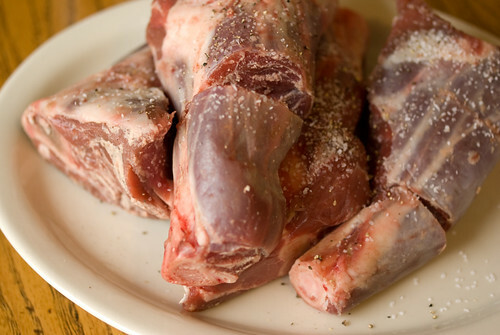 I have a rather unhealthy seeming LOVE of lamb. I may need to try a modified version of that. Yummmmmmmm. Absolutely! If you left out the onions and garlic, it would still be mighty tasty. Maybe up the fresh ginger even more? This is really all about the ginger. And the prunes. And bookmarked! This looks absolutely amazing!